Candles work on so many different levels in a room scheme. They offer style, scent, colour and a huge range of choice - so really do make a great 'must have' accessory. If you are strapped for cash, you need only buy some inexpensive tealights and invest a little more in a jar or holder, alternatively, there is now a thriving luxury candle market for those of you feeling more indulgent. Whatever the budget, I find that candles really can add a luxurious feel to a room. I am currently obsessed with the amazing array of scented candles now available and on a recent visit to the True Grace shop in Bath, my friend and I managed to spend nearly an hour sniffing our way through the entire range! (Thanks again to the incredibly patient shop assistant!). I was amazed to smell a scented candle called 'Bonfire' from the new Manor collection, which for me evoked vivid memories of my Grandad's garden bonfires in the Autumn. Equally, 'Moroccan Rose' reminded me of exotic sun-filled trips - I loved the way these scents played with my senses. I'm keen to know if you have a favourite scented candle too? Candles can look great anywhere in a room, scented or unscented, they can take centre stage on a coffee table for example or if you are short of surface space, try a wall sconce. 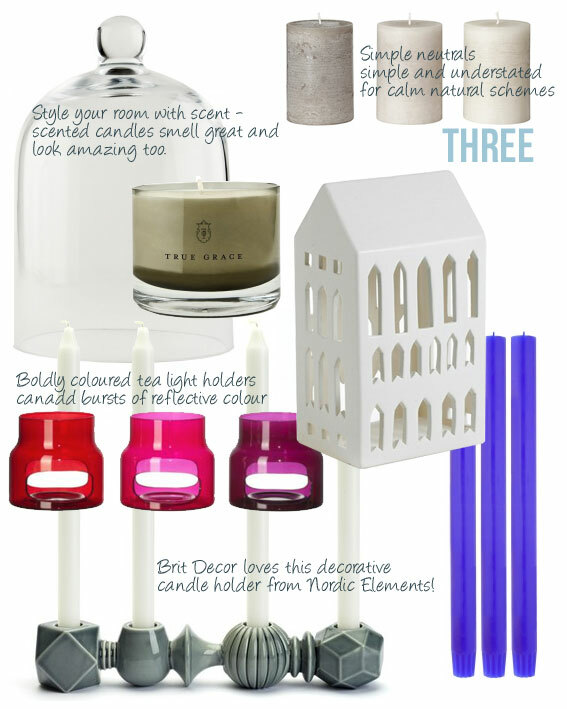 Brit Decor's top ten budget makeover tips!